Colonel Brian, a colonel in the kiss army, is an old man trapped inside of an aging man's body. His political columns have appeared in various national and regional publications and has worked undercover as a member of the proletariat for nearly 30 years. He is sharp, prolific and in step with his following. Hailing from Pikey mountain After Lodge Jason has worked as a tow truck driver, pizza driver, Electrician but has been a delivery guy for about the past ten years. Founding member of the infamous After Lodge Podcast with Producer Bruce and Harlan the trusty Hebrew. Beard enthusiast. Mayor Bruce has delivered more cartons of milk than any man, woman or child could drink in a lifetime. So speedy, so accurate, so phenomenal has been his delivery service record that he was elected against his will as Mayor-for-life of Milktown, where he toils six days a week to ensure that each one of his constituents receives every cup, carton, and quart they order. Keeping the dairy maids in line, and the milk moving is a thankless job, but somebody's got to do it. Wolfkid is a man with no sense of embarrassment. With a start slinging pizzas dressed as a tomato on the roadside, he soon moved to slinging sausages at the local supermarket. Moving on he found himself working in a shipping hub loading trucks to get you folks all the nice things you order. Recently self-unemployed he is looking forward to all the joys of warehouse work and show production. The executive producer of all that is Eldorado. A mystery man who is more capable with snapchat filters that a popular eighteen year old girl. He is our Charlie and we are his angels. This dude does a regular podcast from the cab of his truck. He is the great white shark of the delivery ocean. 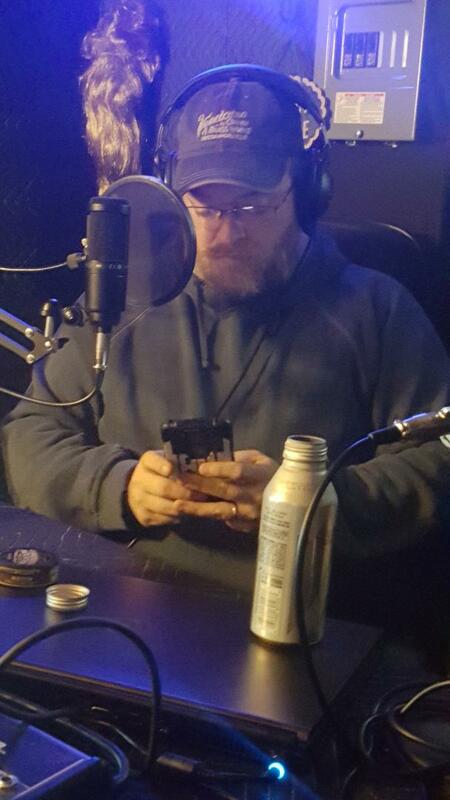 A hard working man who won't stop working to do his podcast (unlike some other guys he knows but is too much of a gentleman to name them). DoodlerJazz , Creative Director, and Show hopper appears randomly on lots of the networks shows, Ever changing hair, leading a cult that may or may not exist of tie dye wearing followers. (If you own tie dye don’t worry you probably don’t remember being initiated and that’s for the best) Jazz has an addiction to caffeine and that is one of the few facts known for sure about a Jazz...the glitter she comes home with everyday is speculated to be from some secret project or maybe from working with Al Bundy. I have been handling After Lodge Jason's business for years, so doing all the business-y stuff for the show is nothing new for me plus I have a background in business management. On a personal note, I am a huge fan girl of many geeky things and will also read just about any book you put in front of me. I am also a mommy to Jason Jr. and Mini-Jason. I'm a Germanophile Biologist-turned-IT Administrator who has a serious passion for science, technology, videogames, food, and random information. I'm also a heavyweight Dance Dance Revolution champion and I can beat the first levels of HOUSE OF THE DEAD and METAL SLUG X without getting hit once; I enjoy playing the devil's advocate and I will debate you over just about anything. Oh yeah, and some lady once even told me I was pretty smart--for a millennial . ½ Sack” - The man. The myth. The legend. Also known as, the host with the most, started his podcast back in early 2017. He started the podcast after meeting up with some guys doing a podcast locally. With a lot of phone calls to “After Lodge Jason,” ½ Sack knew this was something he wanted to do. The Half Hour with 1/2 Sack was born. The venture started off with a format of ½ Sack talking to interesting people, whom he hoped others would find interesting as well. After 3 episodes, good friend and 25-plus year friend, “Little Rick” was brought in to co-host. That’s when all hell broke loose. Little Rick gets his kicks out of pushing ½ Sacks buttons (editing button, that is). ½ Sack is an avid motorcycle rider, hunter, fisherman, camper, and handyman. You name it, I probably have done or tried it. Above all, I am a father, husband, son and friend. Little Rick spends most of his days trying to figure out new ways to aggravate Half Sack. With this comes the constant threat of being fired but that doesn’t stop him!! Trying to start a #BAAB army Little Rick is a wild card. Always be prepared and if you have a show that he appears on be careful, you will need extra time to edit, ask Half Sack. Russ, A man of many skills and talents. He is a fan of drinking bourbon and raising chickens, along with raising his ducks turkeys and randoms. He lives in the woods and is a man of few words until he has a mic in front of him and his true luscious radio voice emerges.